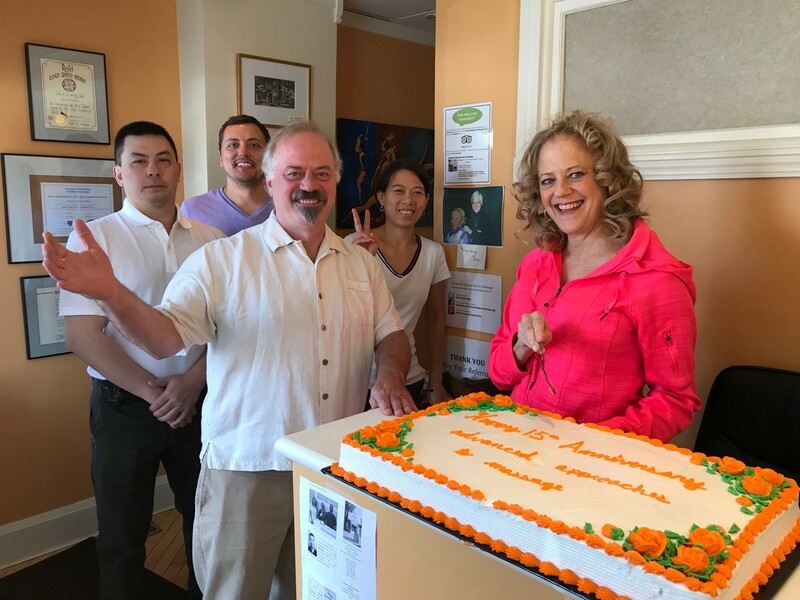 Su Willson and her team at Advanced Approaches to Massage on Kingston Road celebrate 15 years in the community with a special cake. We all know that a massage makes your body feel good. But Su Willson, owner of Advanced Approaches to Massage, believes a truly great treatment should also benefit your mind and soul. Now celebrating her 15th year on Kingston Road, Willson sees her role as a massage therapist and healer going beyond what you might normally expect and it is this approach that has garnered her so many accolades over the years, not to mention happy, healthy clients. Having gained a degree in music at U of T and planning a career in the field, Willson’s path in life took a different direction when she ‘had a calling’ to the art of healing and set out to learn everything she could about a variety of treatments that included Shiatsu, Reiki and body-oriented psychotherapy. She traveled extensively to places such as Thailand and Bali gaining knowledge from native elders, before returning to Toronto to begin her practice and share her gift with others. Far from content to rest on her laurels, Willson is determined to keep learning, giving her the ability to provide her clients a full range of care that now even includes Conscious Uncoupling Counselling. It is this same nurturing spirit that Willson extends to her community as a whole and why she is one of the longest serving members of the Kingston Road Village Business Community Association. Her work as an active volunteer with the group, which organizes local events such as the Kingston Road Village street fests and the Beaches Santa Claus parade (which takes place on Sunday, Nov. 25), gives Willson a chance to give back to the community which she loves and wants to see grow and evolve. While physical health is of utmost importance, and obviously a huge part of Willson’s business, she believes that social connections and giving back are also vital to our wellbeing. And giving back is exactly what she is doing in donating a portion of all proceeds from her business this year to three local charities (Pegasus Community Project, Variety Village and Community Centre 55).